Digilocker regisrtaion process, how to use & upload documents: Digilocker is one of the important initiative of Government of India under the “Digital India” initiative. Just like physical locker that stores various important things in it, digilocker store documents and certificate in virtual form. It is a national “digital locker” service launched by the Government of India in the year 2015 for the citizens of India so that they can store their crucial documents/certificates such as Aadhaar, PAN, and other certificates issued by government agencies on cloud. 2 How to activate digilocker account? 3 How to upload certificates and documents? 4 How to eSign documents in Digilocker? 5 How to share documents via Digi locker? 6 How to get E-Aadhaar in digilocker? It has also been launched to facilitate paperless governance in India. With this facility citizens can upload, digitally sign (eSign) and share their documents at any time and place. All the documents on this platform are equally valid as of the physical documents. For instance, citizens can show their driving license, e-Aadhaar, mark sheets, certificates and other documents on digilocker wherever and whenever required. With the help of digilocker, citizens can access their digital documents at any time, and anywhere. They can also share their documents through this app. It reduces the burden of carrying and holding burden of physical documents for both administrative departments of government and common citizen. Therefore, it also helps in reducing the use of paper. Validation of authenticity and genuineness of documents become easy these docs are directly issued by the registered issuers. You can upload documents by your own and these documents can be eSigned. It is similar as the process of self-attestation. These e-documents are more secure and protected than the physical documents. It saves time and is more convenient than other methods. How to activate digilocker account? To work in Digilocker, citizens are required to sign up first. They need to have a valid mobile no. to open an account in Digilocker. They do open a new account from the official digilocker portal or through the mobile application. Signing up in digilocker is very easy. For the convenience of the users we have explained the sign up process in few easy steps. Click on the “Sign Up” button given on the homepage of the portal. Sign up page will appear. You have to enter your mobile number and have to click on “Continue” option. Now, create your username and password as per the instructions given. You can also use your mobile number or email as your username. Your digilocker account will be successfully created after you will click on “Signup” button. After the creation of account in digilocker, you can also submit your Aadhar details. Submission of Aadhaar details allow you to avail the services on digilocker. In order to submit the aadhar details, you have to enter the Aadhar number in the box provided and have to click on Submit option. After that, you can avail all the digilocker services whenever required. You have to login by using the username and password you have created. How to upload certificates and documents? Digilocker is an electronic platform to hold documents and certificates in electronic medium. Once you have sign up the digilocker you can upload your documents/certificates. 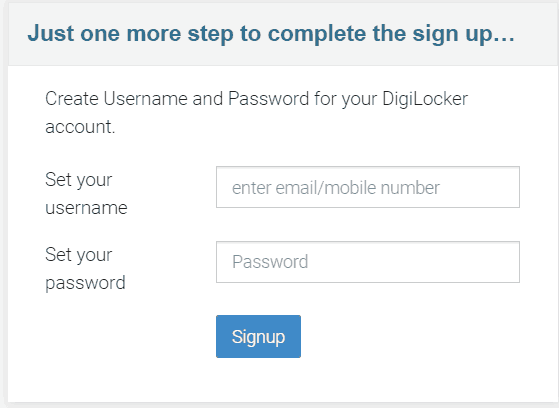 You have to start by Signing in to the digilocker account using your username and password set during activating account. All the given activities will be performed only in the document upload window. After signing up, click on “Uploaded Documents”. Click on the “Upload” mentioned on the screen as shown in the picture. You can upload more than one documents at a time. These steps will also be performed in the document upload screen. Click on the “Upload” tab. Here you have to choose the location and select the file (s) you want to upload. Once you have selected the file(s), click on “Open” button. You can select multiple documents at a time. The selected documents will get uploaded. You can see all the documents in the uploaded documents list. This step is to set the type of document you have uploaded. Click on “Select Document Type” for any of the document available in the uploaded documents list. A drop-down box will appear, select the document type. In case, your document does not match with the predefined document type then you have to select the “Others” option in the drop-down box. The document type will be updated. You can see the same reflecting in front of the document. How to eSign documents in Digilocker? Digilocker also provide a facility to e-sign the documents and certificate uploaded in digilocker. E-sign is one of the efficient and easy way of signing electronic documents digitally. Login the digilocker account using desktop or mobile application. Open the “Uploaded Documents” icon. The list of uploaded documents will appear. Click on the “eSign” link provided in the front of the document you want to sign digitally. You will receive an OTP on your mobile no. Enter the OTP in the text box (pop up) and click on eSign button. Selected document will be eSigned. You can only eSign one document at a time. Once selected document will be digitally signed it will be converted into PDF if it is not a PDF document. How to share documents via Digi locker? Step 1- Start by visiting the digilocker website. Step 2- Sign in using the valid credentials. Step 3- Click on the upload document link. Step 4- The list of uploaded documents will appear. Step 5- Click on “share” link given on same section. Step 6- A pop will appear on screen. Enter the email ID of the person/entity with whom you are going to share it. Step 7- Click on send button. Step 8- Selected document will be shared. You can only share one document at a time. You have to repeat the same procedure each time you want to share a document on digilocker. How to get E-Aadhaar in digilocker? If you have linked your Aadhaar with your Digi account, then you can also access your digital Aadhaar using Digilocker. Aadhaar issued by digilocker is same as E-Aadhaar issued by UIDAI. Sign in the digilocker account using login credentials. A dialog box with a message to get your Aadhaar will appear. Hit the “Click here” link and OTP box will display. You have to enter the OTP that you will receive on your registered number. After validation of OTP, you will redirected to “Issued Documents” page. On this page, URI for e-Aadhaar will be listed. On the same page, click on “save” button mentioned next to the eAadhaar card. Finally, your eAadhaar will be saved and listed in the “Uploaded Documents” section. Recommend Read: Check you aadhar card status for application applied. Digilocker is also available in the form of mobile applications. Users can download the application on their mobile and can use it whenever required. How can I access Digilocker? Are all the documents issued on digilocker are valid? Can I update or change my registered mobile no.? Yes, you can change or update your registered mobile no. The update option is available in the profile section but it is available only if your digilocker account is not linked with your Aadhaar. Can I change my username in my Digilocker account? No, in the current version of this application no such facility is available. You cannot change your username that you have created in Digilocker. What is the maximum size of file that I can upload? You are allowed to upload a file of maximum 10MB in size. What are the types of file that can be uploaded? You can upload any file in PDF, jpeg and png format. How many times a document can be digitally signed? You can digitally sign your documents only one time in digilocker. Already eSigned documents uploaded in digilocker cannot be eSigned again. Can I use a mobile number to sign up a new account which is already registered with a digilocker account? No, it is not allowed. You can open only one account with a single mobile number. To open a new account, you will need a new no. which is not registered. Can I delete activity list in my digilocker account? No, you cannot delete or edit the list of activities. You can only view all the activities you have performed. This option is only provided to view the activities. I am an NRI, can I sign up using a non-Indian/Foreign No.? No, you can only sign up by using an Indian mobile no. How will issued documents show up in my Digilocker account? Push (via Aadhaar)- Push methods works for the digilocker accounts which are seeded with Aadhar card of the user. After issue of an e-documents by a registered issuer for a particular Aadhaar number, the URI for that document automatically pushed into Digilocker. Pull (via parameters)- It is applicable when the database does not contain the seeded Aadhar number. Citizens can pull their record from the issuers database by using certain parameters. The URI will be saved in the issued document section once the record is fetched. What do mean by URI? URI stand for Uniform Resource identifier which is generated by the issuer. It is compulsory for all the e-documents of the digilocker system. URI is unique and can be resolved to a full Uniform Resource Locator (URL) in order to access the actual documents in its repository. Are document safe in online in digilocker? How to delete digilocker account? You can not delete your digilocker account, however you can delete the documents uploaded and issued online. Citizens- Citizens can create their account in Digilocker and avail the facilities such as uploading, issuing, eSigning and sharing of documents. Issuer- All the agencies which are registered with digilocker to issue e-documents to citizens such as UIDAI, CBSE, Income Tax Department, Registrar office etc. Requester- In context of Digilocker all the government departments and organization such as Passport office, revenue dept, municipality departments, banks, telecommunication org. etc. wherever documentation is required comes under the purview of requester. If an organization want to issue documents using digilocker or wish to be a requester in this system, it needs to be registered with Digilocker first. They have to contact the support team as it will forward this request to the on-boarding team of Digilocker.